Twenty years ago today the World Wrestling Federation presented a pivotal, watershed event in company history with In Your House 10: Mind Games. While the “Attitude Era” wouldn’t begin until 1997, the seeds of the era are on full display in this event. 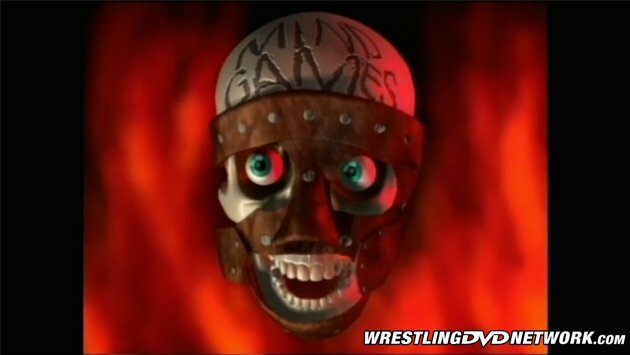 From the language to the suggestive commentary to the violence of the main event, In Your House 10: Mind Games found the WWF pushing their usual boundaries and hinting at the direction they would be forced to take to combat the growing popularity of WCW and the New World Order. This week, with the help of the vault of the WWE Network, Throwback Thursday on WDN looks back at In Your House 10: Mind Games to see just how well this classic IYH event holds up. Context is no issue as all previous RAW’s and PPV’s are currently available on the Network. After a video package highlighting the two main events for the show, Undertaker/Goldust and Shawn Michaels/Mankind, Vince McMahon, Mr. Perfect, and Jim Ross welcomes us to Philadelphia for Mind Games. As Justin “Hawk” Bradshaw waits in the ring Kevin Kelly interviews Savio Vega about the upcoming match with Bradshaw. During the IYH 10 “Free For All” (currently unavailable on the Network, though the match can be found here) Savio Vega defeated Marty Jannetty. After the match, Bradshaw attacked Savio with his cowbell, leading to Vega challenging Bradshaw to this “strap” match, Bradshaw’s WWF PPV debut. Sitting at ringside for the match were ECW’s Sandman, Tommy Dreamer, and Paul E. Dangerously, who end up getting mildly involved in the match, setting off a string of “E-C-W” chants. This was the beginning of the WWF-ECW crossover that would help put ECW on the match nationally. As for this match, it’s the basic “strap” match one would expect from the WWF. Bradshaw drags Vega with him as he touches the first three corners before Bradshaw inadvertently pulls Vega into the fourth and final corner for a Savio Vega win at 7:07. Nothing much to see here. Next we get a vignette highlighting the Lothario/Cornette feud. As Cornette comes to the ring we cut to the back to find “Diesel” and “Razor Ramon” putting the boots to Savio Vega. Cornette, looking wonderfully ridiculous, comes out to Vader’s music and cuts a promo on Lothario in the center of the ring. Shawn Michaels’ music hits and Jose Lothario walks to the ring in a “Heartbreak Kid” jacket. This one is over before it even begins. Jim Ross and Mr. Perfect have some fun at Cornette’s expense with a few priceless zingers. After throwing Cornette around the ring Lothario hits a couple of big left hands to get the pin at 0:57. We get a WWF Superstar Line promo next, selling the upcoming Ahmed Johnson/Faarooq match to fill the Intercontinental title vacancy the next night on RAW. Brian Pillman comes out and rips the American fans before bringing out Owen Hart. Owen says Bret Hart is scared to return to the WWF because of “Stone Cold” Steve Austin. Owen brings out Austin who rips Bret Hart, saying, in part, “If you put the letter ‘S’ in front of Hitman, you’ve had my exact opinion of Bret Hart.” After the in-ring interview segment is through we see footage of Mark Henry seeing the historic sites of Philadelphia. Before the match begins we see Cornette in the back on the trainer’s table in severe pain. Clarence Mason has Cornette sign some papers allowing Mason to be at ringside with Owen and Bulldog in Cornette’s place. The Gunns come to the ring and drop the usual Sunny poster from the ceiling only to find it’s been defaced by Owen and Bulldog, setting Sunny off. The story in this one is the Gunns continued problems. Billy is much more concerned with Sunny than he is Bart or the WWF Tag Team titles. After some solid tag team wrestling Billy, distracted by Sunny, collides with Bart. Billy pushes Bart into Bulldog who hits a picture-prefect running powerslam for the the pin and the WWF Tag Team Championship at 11:00. This marked the end of The Smoking Gunns third and final WWF Tag title reigns, a reign of 119 days. The win marked the first and only WWF Tag Team title win for the team of Owen Hart and The British Bulldog, though it was the third Tag title reign for Owen and the second for Bulldog. After Bulldog and Owen head to the back Sunny gets on the mic and fires The Smoking Gunns, running off before Billy can catch up with her. Next, Kevin Kelly interviews Paul Bearer and Mankind in “the bowels of the CoreStates Center” about the upcoming WWF World title match between Mankind and Shawn Michaels. Lawler cuts a promo, getting all the heat he needed and then some. This was Mark Henry’s WWF TV in-ring debut and it’s clear that the powers that be were very high on Henry. This is little more than a squash with the sole intention of getting Henry over big, though it does have a few fun spots. In the end, Henry cinches up a Canadian back breaker for the submission win at 5:13. 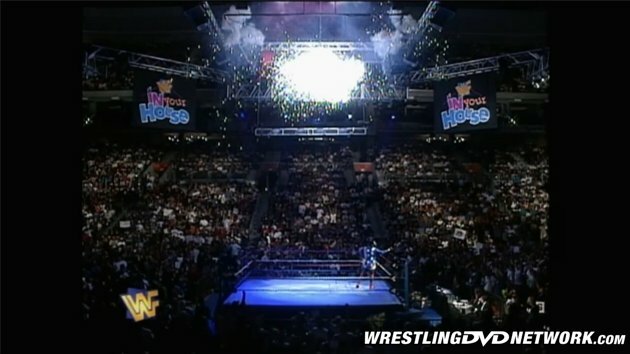 After the match Leif Cassidy, Marty Jannetty, and Hunter Heasrt Helmsley attack Mark Henry, who fights them all off, finally tossing Helmsley over the top rope onto Jannetty and Cassidy, after which Henry celebrates in the ring as pyro goes off. 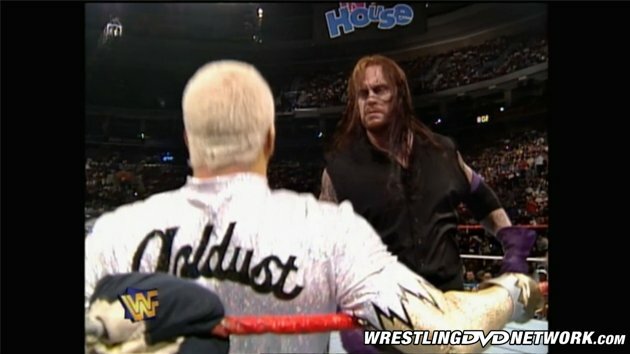 At ringside the commentary team discuss the next In Your House event, Buried Alive, and why the match will be unsanctioned, after which we see a vignette detailing the Goldust/Undertaker feud. This was supposed to be a street fight, with no DQs and no countouts, but the referee, for whatever reason, didn’t get the memo and went about enforcing every rule in the book. Of the PPV battles these two had in 1996 this one is the least entertaining, in my opinion. But, seeing as what was in store for the main event, it’s no wonder this wasn’t the war many had hoped it would be. Undertaker caught Goldust on the top rope and delivered a massive chokeslam before putting out “The Bizarre One’s” lights with a crushing Tombstone Piledriver for the 1-2-3 at 10:23. Backstage Kevin Kelly interviews a flustered WWF World Heavyweight Champion Shawn Michaels about the forthcoming championship match with Mankind. 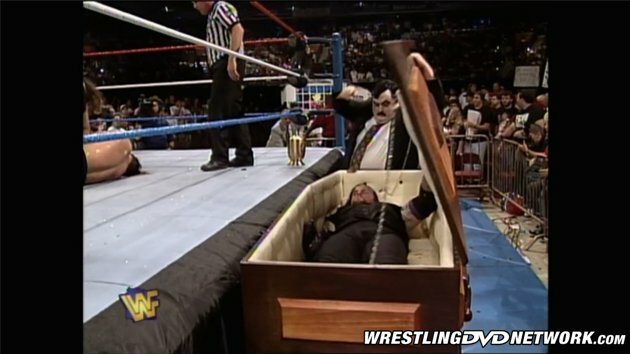 In the arena Mankind’s music hits and Paul Bearer comes out alone, pushing a casket to ringside. Bearer pushes the casket to the far side of the ring where he stops, opening the lid to reveal Mankind inside. This match is a war, plain and simple, and one of the best WWF World title matches of the era, if not ever. Mankind was in a state of war with The Undertaker while Shawn Michaels was in the closing stages of his battle Jim Cornette and Vader. Employing top level psychology and intense action, this match put Mankind over the top and gave Shawn Michaels the kind of credibility the “Heartbreak Kid” sorely needed. After spectacular brawling in and out of the ring involving ring stairs, steel chairs, and tables, Shawn Michaels catches Mankind on the top rope with a leaping superkick, kicking a steel chair back into Mankind’s face. Michaels makes the cover but Vader runs in and breaks it up, giving Shawn Michaels the win by disqualification at 26:22. This match ended up as the 1st runner up for Pro Wrestling Illustrated’s “Match of the Year”, second to Bret/HBK from WrestleMania XII. Michaels knocks Vader over the ropes where Sid is waiting. Sid “punches” Vader in the face and the two fight up the aisle until referees break it up. Meanwhile, in the ring, Paul Bearer brains HBK with the urn from behind, knocking Michaels out. Mankind and Shawn Michaels rise at the same time and Michaels is caught with the Mandible Claw and put out again. Mankind calls for the casket to be opened as he rolls Michaels to the edge of the ring. Paul Bearer opens the lid and the Undertaker pops out! Undertaker throws Mankind over the top rope by his neck as the crowd comes unglued and stalks Mankind to the locker room. 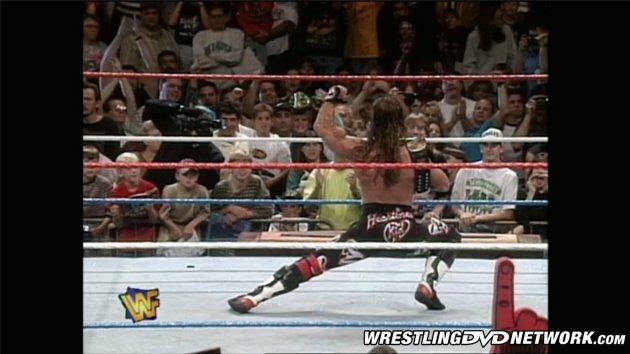 In the ring Shawn Michaels is announced the winner and begins to celebrate, even showing off a heart tattoo on the right cheek of his derriere. After replays and hype for the next In Your House event, we see a highlight package of the night’s event before the show goes dark. In Your House 10 came at an interesting time for the WWF with WCW breathing down their neck and the ratings starting to turn. While the WWF kept their nose to the grindstone and stayed the course with this event, the seeds of change are present. The most noticeable aspect of this event, in hindsight, is the struggle going on in the WWF between maintaining the image that brought the company worldwide success and the need to change and evolve to stay relevant in the rapidly changing marketplace. IYH 10 is one of the better IYH events of the time and remains a classic WWF PPV. If you’re already signed up for the Network check it out, see it for yourself, and let us know what you think. That’s a wrap for this week’s TBT on WDN – thanks for reading! For more on the award-winning WWE Network, drop by our friends at WWENetworkNews.com. Watch every WWE PPV in history (including Clash of Champions) and 6,000 more hours of content only on WWE Network. Your first month is FREE! Click here to subscribe to WWE Network. 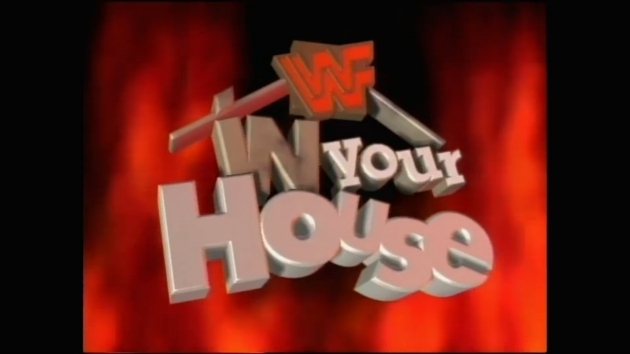 Loved some of the In Your House Events, any chance of these being released on DVD or Blu-Ray here in Australia along with other pay-per-view events 1998-2001. Mankind vs Shawn Michaels was a great match.